I claim there is substance besides the nice words. CEDEO started from the consideration that many video platforms exists today on the Web, but none, if not for limited contexts, offers platform users – i.e. any player in the video content life cycle: content creators, providers, distributors etc. – the means to do business with other platform users. In other words, support to business is regularly “client- server”, not “peer-to-peer”. 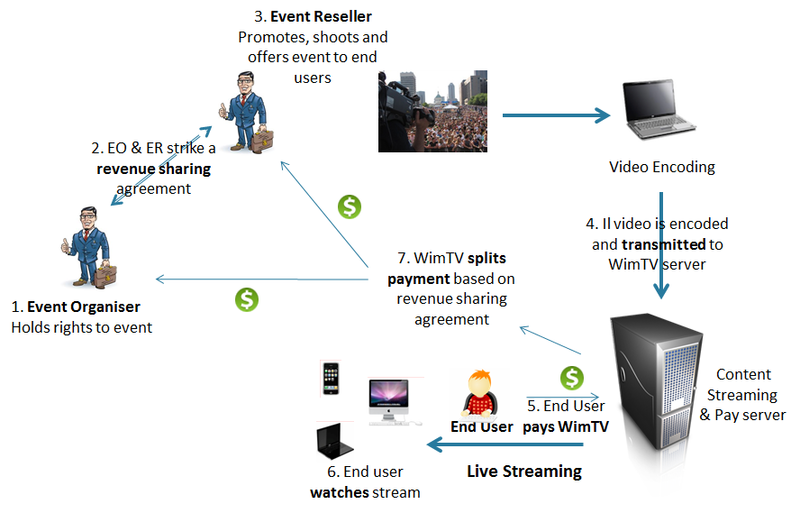 Letting peer do business in a peer-to-peer fashion is exactly what WimTV does, as shown in Figure 1. By creating and posting a request for content (WimTrade) satisfying specific requirements. Post to WimVod and stream content of which he has rights to end users. It should be no surprise that, say, YouTube and WimTV are worlds away. This can be seen from two excerpts of the YouTube and WimTV Terms of Service. The bottom line is that, in the case of YouTube you upload content and then YouTube has the right to do business on it, while in the case of WimTV you upload content and you keep the right to do business with it. You can do this more successfully on WimTV than on your own because the WimTV platform offers you a variety of services. …These Terms of Service apply to all users of the Service, including users who are also contributors of Content on the Service. YouTube hereby grants you permission to access and use the Service as set forth in these Terms of Service, provided that You agree not to distribute in any medium any part of the Service or the Content without YouTube’s prior written authorization… …When you Import and Post Content to the Platform, you remain the sole owner of the rights to that Content and Company does not claim ownership of the materials. Fig. 2 depicts the essence of WimTVin a concise way: a platform where user A and user B can do business on the basis of the most fundamental of principles: they share a business model based on which user A gives right to his content to user B and user B pays a certain amount or promises to pay a certain amount or a share of his revenues every time a transaction based on the content takes place. 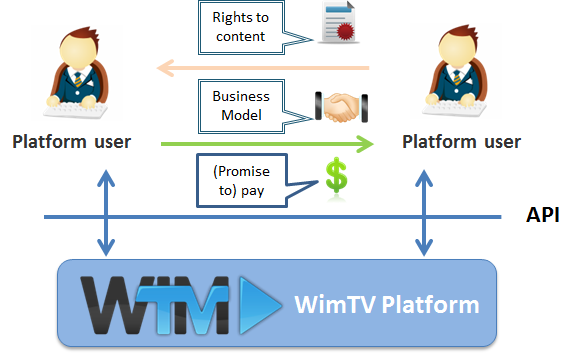 The WimTV platform provides a number of services that users can call when they do business on the platform. 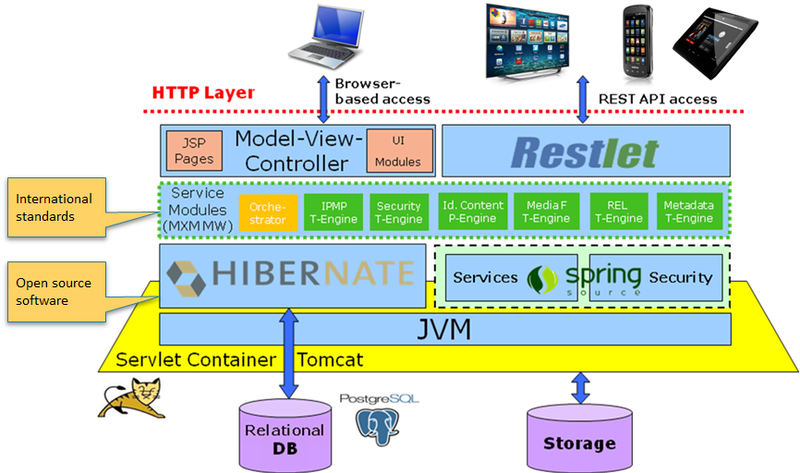 The platform is based on a low layer of very robust Open Source Software (OSS) layers and a middleware that makes reference to MXM. The platform exposes a standard HTTP interface for browser-based access and a Representational State Transfer (REST) API that applications on a variety of devices can access. 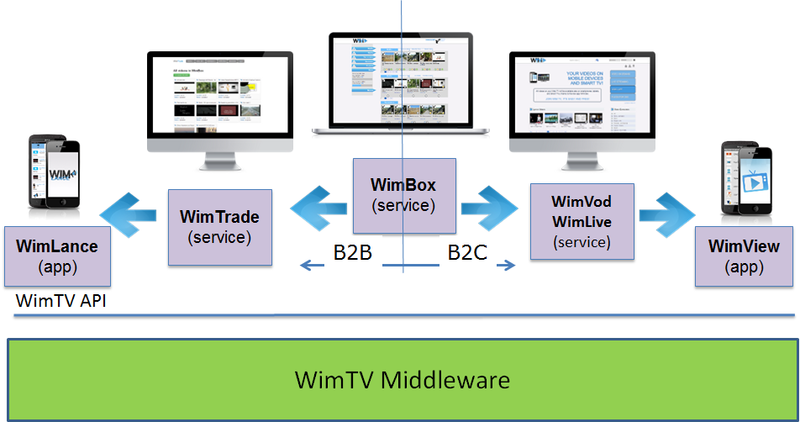 An example of the type of services provided by the WimTV platform is illustrated in Fig. 4. Here a user (called Event Organiser) sets up an event and makes an agreement with another user (called Event Reseller) to distribute the event, including the level of revenue sharing between them. The two users register on WimTV specifying their roles and informing WimTV of their revenue sharing arrangement. For every end user buying a “ticket” WimTV will split the revenues among itself and the two users and, between the two users according to the revenue sharing agreement. 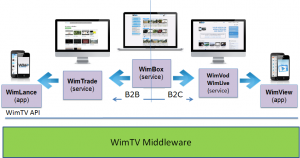 The service has low administrative costs (the burden is taken over by WimTV). Platform licensing to users who intend to develop apps and offer services with licensee’s brand.